I had a day off work on Monday and decided to spend my morning doing some shopping. I popped into LUSH and was very pleasantly surprised at the choice of products in their Valentine's range. Of course I decided to treat myself to a couple of Valentine's goodies. 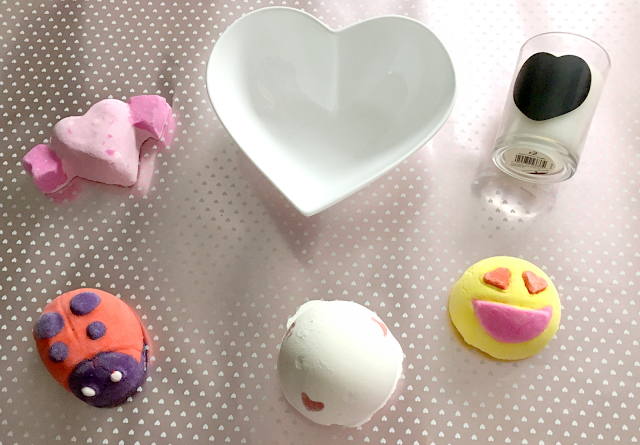 The first item I picked up was the 'Lover Lamp bath bomb', a returning product which I have previously tried and really liked. I also picked up a Ladybird bubble bar, which is another returning product (however, I'm pretty sure this has previously featured in the Spring range rather than as part of the Valentine's range) but is one that I've not tried before. The final two products I purchased were the Cupid bath bomb and Lovestruck bubble bar, both of which are very Instagram worthy, don't you think? I had been planning on purchasing the 'Two Hearts Beating As One' bath melt, however I didn't really like the scent so I decided against it.